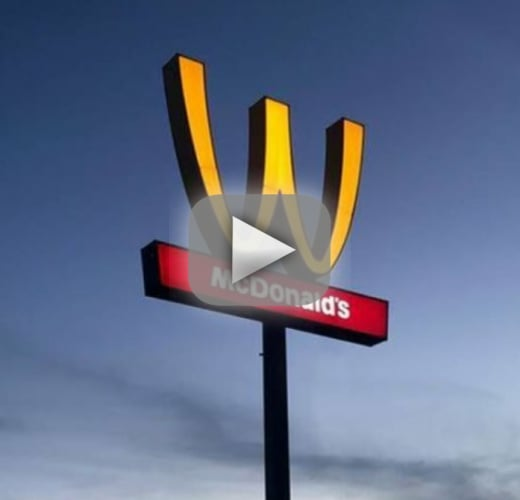 If you've noticed a McDonald's sign where its famous golden arches are turned upside-down to form what looks like a yellow "W," no, it's not an elaborate prank. McDonald's has simply chosen this as a symbolic gesture to celebrate International Women's Day. Obviously, the yellow "M" doesn't stand for "men" the other 364 days of the year. But, as McDonald's announced via Twitter, they wanted to celebrate the role that women play in the world and in their company. "Today, we flip our Golden Arches to celebrate the women who have chosen McDonald's to be a part of their story." And here's a dazzling statistic that some may find surprising. "In the U.S. we’re proud to share that 6 out of 10 restaurant managers are women." Managers aren't the same as owners or board members, but that's not nothing, folks. Not all restaurants flipped their signs, but a number have. Apparently 100 different McDonald's restaurants have the upside-down "packaging, crew shirts and hats, and bag stuffers" to celebrate on Thursday. Responses have varied, and the move is certainly getting a lot of attention and free publicity. Some who aren't on social media might have forgotten that Thursday was International Women's Day at all if the story weren't getting so much buzz. Wendy Lewis, McDonald's Chief Diversity Officer, elaborated on the company's motives behind the gesture. "From restaurant crew and management to our C-suite of senior leadership, women play invaluable roles at all levels, and together with our independent franchise owners, we're committed to their success." That's … a very corporate-sounding message, but there's nothing wrong with that. Entertainingly, for copyright purposes, a lot of Japanese animation has, for years, featured characters attending unnamed fast food restaurants to eat burgers and fries. These restaurants are represented by giant yellow "W" signs, clearly representative of McDonald's without directly infringing upon their trademark. This ongoing workaround trope has led a number of anime fans to refer to such restaurants as "WacDonald's." As a result, some people have joked on social media that anime McDonald's franchises had been celebrating International Women's Day for years. Some on social media have joked that McDonald's now has grounds to sue "every anime ever made," though we don't know that the legal argument would hold up in court. It is strongly unlikely that corporate leadership of McDonald's had this in mind when they decided on this gesture. Some suggest that this symbolic move is "reductive," akin to offering pink things to "celebrate" women in an empty gesture that is almost insulting. Some have pointed to the "W" signs as seeming like something out of a The Onion article. And then some put the restaurant on blast, writing: "Instead of empty gestures like flipping your arches, how about improving working conditions for your women workers?" Others, however, point out that International Women's Day is a holiday and that McDonald's putting up decorations is a nice reminder. Take a look at this short video showing a few examples of the fast food franchise's transformed signs. The Voice Recap: Are The Knockouts Worth The Drama?